Englishman James Gillray (1756-1815) was one of the finest caricaturists of the Georgian period. First apprenticed as an engraver in London, Gillray then attempted to launch himself as a conventional artist by studying at the Royal Academy School. But it was in caricature where Gillray found his true calling. He is thought to have published over a thousand satires during his lifetime, drawing special attention for his lampooning of George III and the royal family. “Progress of the Toilet” is a set of three images published by James Gillray on February 26, 1810. Each picture represents a different time of day from morning, afternoon, and evening. The ever-changing furnishings highlight the impractical extravagance that required women to change three times a day. These originally hand-drawn and colored prints pour ridicule on the fashions of the period dictating how the shapes of women should be accentuated to imitate artistic depictions of femininity. 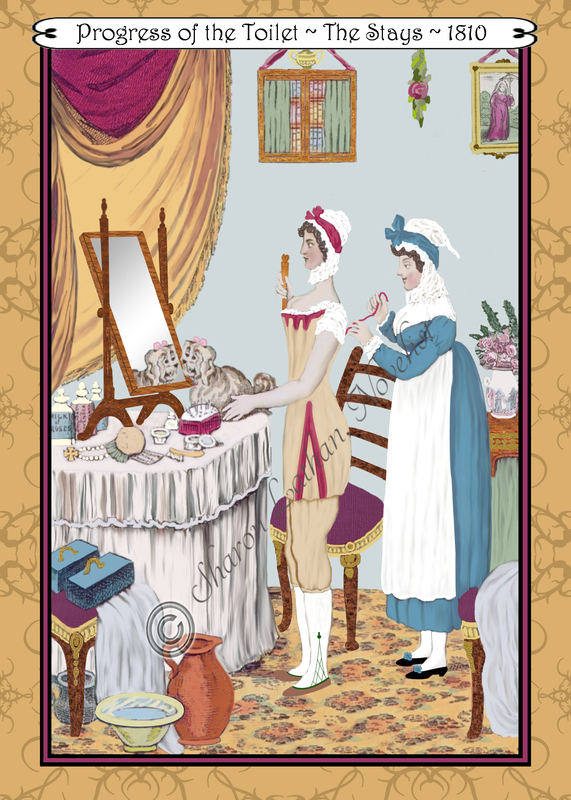 The series offers a detailed insight into the world of women’s fashion in 18th century England. Although lacking the distortion or grotesque nature as do many of Gillray’s caricatures, they subtly satirize the manifold ways in which nature was beautified and falsified. Unlike fashion plates, which were created by the artist for a specific fashion magazine of the era, these types of caricature and satirical drawings were sold in bookshops and other stores. What this means is that a particular fashion plate was printed inside the magazine, and thus always the same, unless reused at a later date in a different magazine. The latter was common with fashion plates from French magazines, many of which were altered slightly to present a gown or ensemble more in line with the preferred modesty of English ladies. Conversely, drawings by Gillray, Cruikshanks, Rowlandson (the giants of caricature during the Georgian era) and others were reprinted over and over for years. In many cases different artists would recreate from an original, or older print, occasionally adding their personal touches or copying from a less than perfect “original”. Therefore, deciphering which digital image is the true version by Gillray is questionable. For my purposes of refining each of these prints, I kept as close to those versions commonly attributed to Gillray by reputable sources, while adding a few of my own embellishments and preferred details. In this first image a young lady has just started her toilet. She is dressed in her undergarments, has stockings and a simple pair of slippers on her feet, and is still wearing her morning cap. She is being trussed tightly into a corset by her maidservant in order to achieve the socially acceptable physical shape popular in high fashion at the time. Aiding the necessary, if perhaps uncomfortable posture and silhouette, the lady is inserting a busk into a pocket in the front of her stays, between her breasts. A busk was a piece of wood, ofttimes painted and/or etched with intricate designs for beauty, which not only forced a straight posture, but also separated the breasts and flattened the stomach (if the stays were long). The busk appears to be instrument of torture, but if the stays were fitted correctly for the woman’s measurements (as they typically would be for a wealthy lady) and were laced and tightened properly to keep the busk in place, it was quite comfortable. Unless one tried to bend over! 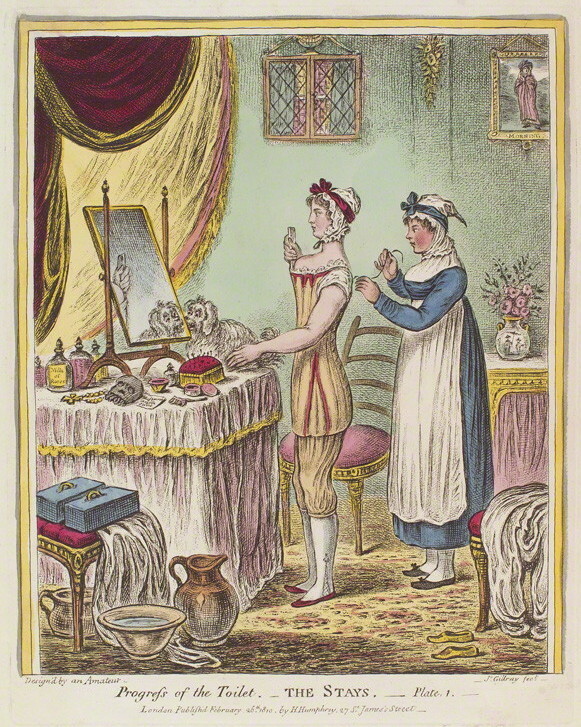 Returning to the print, on the dressing table are the lady’s jewelry, pins, and various concoctions used by Regency women to beautify themselves. On the floor are a bowl and a pitcher with water for washing. As a final note, the cute puppy is an adorable addition. In the second print of the series, it is now afternoon and time to change her dress. 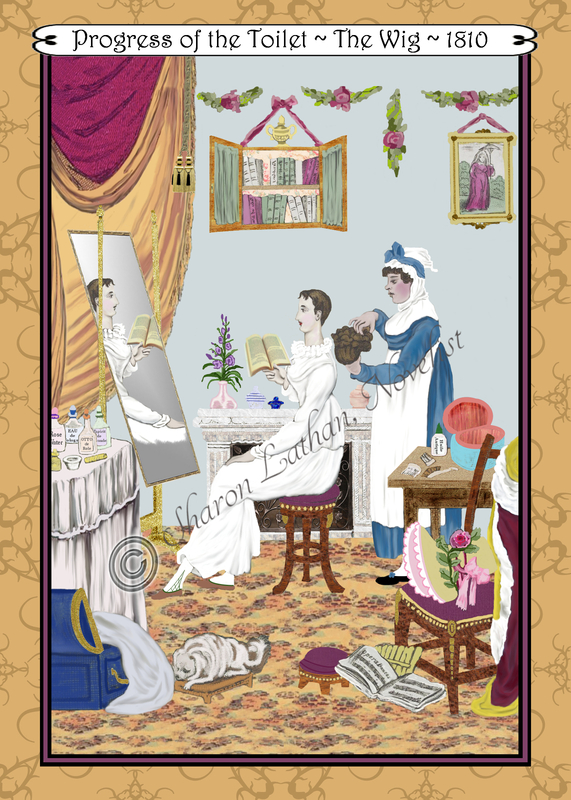 The lady sits on a cushioned stool reading a book taken from the wall shelf above, while her maid prepares a brown wig to cover her hair. Wigs at this time were quite simple, often short, and very different from the powdered and elaborate styles that was popular in the previous century. She is wearing a white gown, very popular during the Regency, with a flower-embellished bonnet and maroon cloak waiting nearby. According to notations from the artist, the lady is reading Delphine, a book by French author Germaine de Staël which scrutinized the restrictions of women in upper class society. In contrast, she is surrounded by all the accoutrements popular with aristocratic French ladies from “Espirit de Lavande” (lavender perfume, on the vanity table) to “Huile Antique” (hyssop water, on table by maid), and a music book for “Opera Dance”. Anything French was considered fashionable, so perhaps she is reading the book more because of its origin rather than its contents! As for the wee pooch, she is worn out from hours of toilette, and resting comfortably on her own cushioned stool. It is now evening and the lady is preparing for an event. She’s wearing a sleeveless white dress embroidered with gold and is putting on her gold evening gloves. Her maid stands aside, ready with her mistress’s shawl and fan. 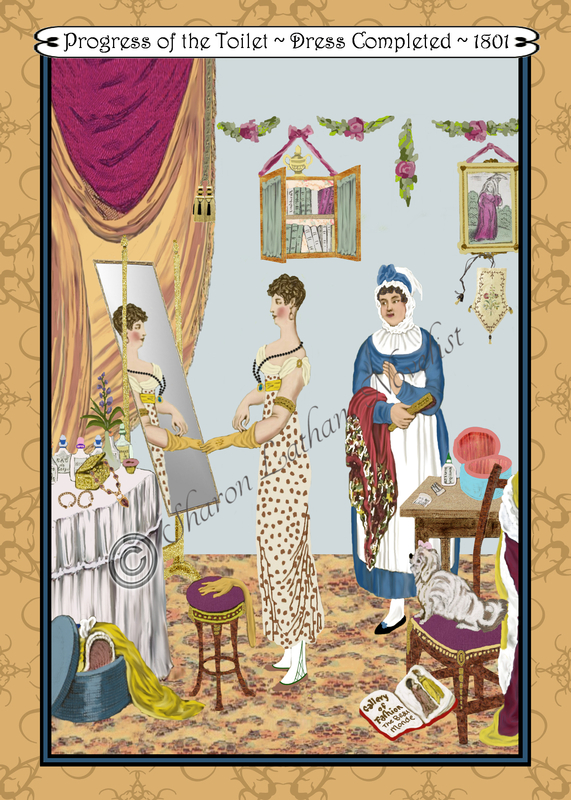 The fan may by kept inside her reticule (hanging from the picture frame on the wall) until she arrives at her destination, where she’ll use it to cool herself and to flirt. For her outfit, she has probably drawn inspiration from the fashion magazine – Gallery of Fashion, The Beau Monde – now discarded on the floor. The woman’s wig is in the hairstyle known as the victime la coiffure: a tousled short style that was modeled on the guillotined heads of the French aristocracy in the Revolution. This was a popular, but contentious style for reasons of nationalism and decency. Gillray’s drawing title claims the woman’s “Dress Completed”, but the implication of the caricature may be that her head still remains undone. Alas for poor Fifi, who appears more enthusiastic than her owner, she will be remaining at home! These “refined” prints, as well as over a hundred others, can be viewed and purchased as greeting cards photo prints on my Regency Prints Refined store on Zazzle. #1 Notice she is wearing drawers over her shift. Her long stays are also over her shift. It is one of the most explicit pictures of a woman’s undergarments. I think it says that drawers were more common than many say. I should mention that there is another version of this particular print where the lady is wearing short stays with the drawers covering her hips and womanly zones. I could not decipher which version was the original, so went with this one. But either way, the shift must be very short or tucked into her pantaloons, which also seems odd. Curious!